The toys hit the road in Toy Story 4 alongside friends, new and old, foes and, of course, Forky. Filmmakers welcomed Christina Hendricks, Keanu Reeves and Ally Maki to the toy box today, revealing the three new characters they help bring to life. Disney•Pixar have unveiled the full-length trailer and the final pay-off poster featuring all of these new toy additions to Bonnie's bedroom. Gabby Gabby is voiced by Christina Hendricks. Says director Josh Cooley. "It became obvious right away that Christina was the perfect actress to play Gabby Gabby. She has the ability to sound inviting and friendly, then subtly become cold and terrifying in just a few words. It still gives me chills when I see Gabby's introduction in the film. Also, Christina told me that she preferred playing with ventriloquist dummies over dolls as a kid. That's when I knew it was meant to be." Duke Caboom is a 1970s toy based on Canada's greatest stuntman. Riding his powerful Caboom stunt-cycle, Duke is always prepared to show off his stunt poses with confidence and swagger. However, Woody learns quickly that Duke has an Achilles heel: He has never been able to do the awesome stunts advertised in his own toy commercial. For years, Duke has been sitting in an antique store, constantly reliving the failures of his tragic past. Duke Caboom is voiced by another great Canadian, Keanu Reeves. Says producer Jonas Rivera. "The first time Josh [Cooley] and I talked with Keanu about the role, Keanu became Duke Caboom. Keanu was asking great questions that dug deep to find the soul of the character. At one point he stood up on the table in the middle of Pixar's atrium and struck poses while proclaiming victory. It was so funny. It's all in the movie and it's all Keanu." Giggle McDimples is a miniature plastic doll from the 1980s Giggle McDimples toy line. Giggle is Bo Peep's best friend. Small enough to perch on Bo's shoulder, Giggle is Bo's confidant, supporter and advisor. Says Cooley. "Giggle is Bo's Jiminy Cricket, we're able to get insight on Bo Peep through their relationship together. Giggle is definitely the smallest toy in the Toy Story universe. She's been stepped on, vacuumed up, and probably put up a kid's nose in her time." Ally Maki voices the tiny character. says Cooley. "Giggle McDimples literally pops on the screen because of Ally's personality and infectious energy. Nobody can laugh like Ally Maki." Benson is a classic, antique ventriloquist dummy, and Gabby Gabby's right hand. He leads a small group of ventriloquist dummies that serve as Gabby's henchmen. With no person to give them a voice, these silent toys patrol the antique store with a looming quietness that is inherently unsettling. Says producer Mark Nielsen. "The dummies are, by far, some of the creepiest characters we've ever created. Our animators really leaned into the truth in materials for how our ventriloquist dummies move. Dummies' bodies are soft with no structure, so our dummies' arms just dangle and their legs bend backwards. Throw in their fixed expressions with their wide eyes and big hinged jaws and they're nightmare material, in the best way possible." Woody (voice of Tom Hanks) has always been confident about his place in the world, and that his priority is taking care of his kid, whether that's Andy or Bonnie. So when Bonnie's beloved new craft-project-turned-toy, Forky (voice of Tony Hale), declares himself as "trash" and not a toy, Woody takes it upon himself to show Forky why he should embrace being a toy. But when Bonnie takes the whole gang on her family's road trip excursion, Woody ends up on an unexpected detour that includes a reunion with his long-lost friend Bo Peep (voice of Annie Potts). After years of being on her own, Bo's adventurous spirit and life on the road belie her delicate porcelain exterior. As Woody and Bo realize they're worlds apart when it comes to life as a toy, they soon come to find that's the least of their worries. The cast includes Tom Hanks, Tim Allen, Annie Potts, Tony Hale, Keegan-Michael Key, Maddie McGraw, Christina Hendricks, Jordan Peele, Keanu Reeves, Ally Maki, Jay Hernandez, Lori Alan, Joan Cusack, Bonnie Hunt, Kristen Schaal, Emily Davis, Wallace Shawn, John Ratzenberger, Blake Clark, June Squibb, Carl Weathers, Lila Sage, Don Rickles, Jeff Garlin, Maliah Bargas-Good, Jack McGraw, Juliana Hansen, and Estelle Harris. Directed by Josh Cooley (Riley's First Date? 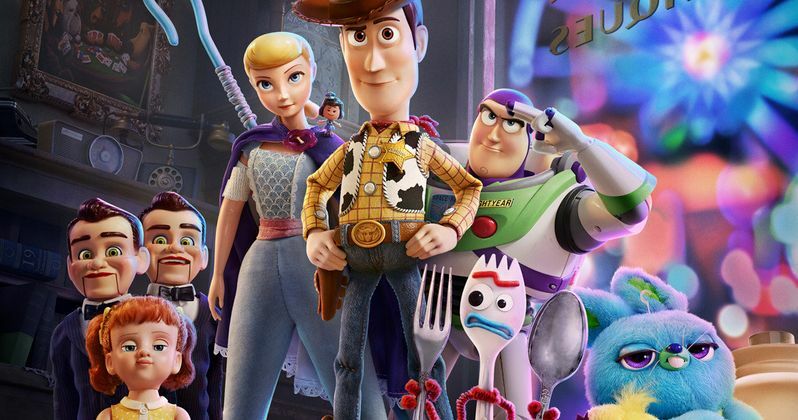 ), and produced by Jonas Rivera (Inside Out, Up) and Mark Nielsen (associate producer Inside Out), Disney·Pixar brings Toy Story 4 to U.S. theaters on June 21, 2019.